HR Panel provides CSR Module using which you can generate proper CSR and private key quickly and easily.No need to use any third party sites to generate CSR. A Certificate Signing Request (CSR code) is a block of encoded text that contains the information about the organization that applies for an SSL certificate, and the domain registration that needs to be secured along with cheap hosting. A CSR is nothing but what you give to the COMODO Certificate Authority, to generate your SSL certificate. It is an essential part of obtaining an SSL certificate. The CSR code also contains the public key that will be embedded in the issued certificate. CSR code with the public key is generated out of the RSA private key and most often CSR and RSA key are generated at the same time depending on the web server type the key pair is generated on. Public and private keys are related in such a way that only a public key can be used to encrypt messages, and only the corresponding private key can be used to decrypt them. Therefore, after the RSA key and CSR code are generated, you can use the CSR code for the certificate activation through your account with us. In the meanwhile, the private key should remain secret and be stored on the server, it will be needed for the certificate installed on the server and will be used to decrypt the information encrypted with the public key. If the private key was lost or deleted, a new pair of CSR and RSA should be generated and the certificate should be reissued.The CSR, as well as the private key, should be generated on the same server that is going to use the certificate. The generation of CSR depends on the server type like Apple, Java, Plesk, Microsoft IIS versions, Tomcat, etc. Once the CSR is generated, it can be submitted to the CA. If the request is successfully validated, the CA will issue the SSL certificate. Step1. Email address will be directly taken from your account details which you have filled while creating the new account in the beginning stage.Email address is required for the purpose of contact. 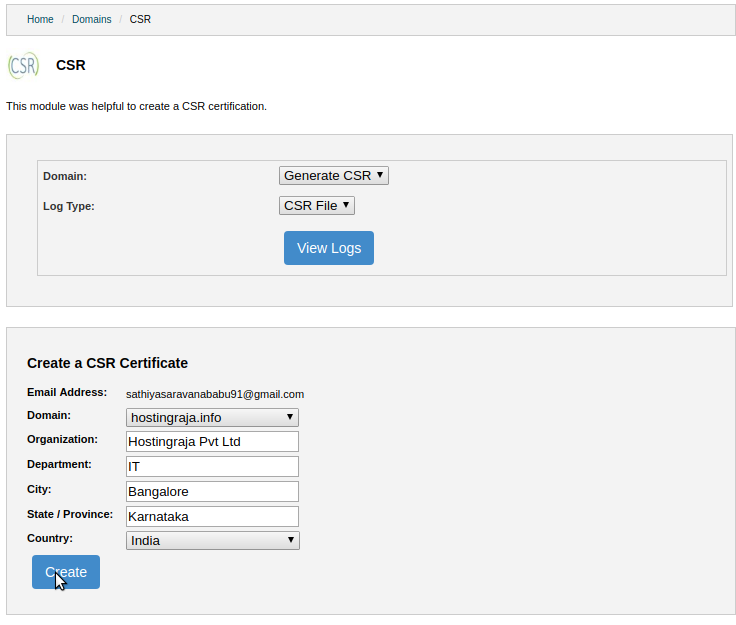 Step2: Select the domain name from the drop-down menu to which you need to create CSR. Step3: Provide with Legally registered company name along with suffix like LTD.
Step4: Enter Department Name to which the business is belonging to. Step5: Enter proper city name where your organization is located. Step6: Mention the State Name to which the city belongs to. Step7: Select the Country from the drop-down menu. Step8: Make sure that you have filled all the details and press on create. Note: Kindly Provide with proper Organisation details if failed CSR Certificate will get rejected. Step9: Once you pressed to create wait for some time and refresh the page the domain name will be visible in the domain part of view logs. 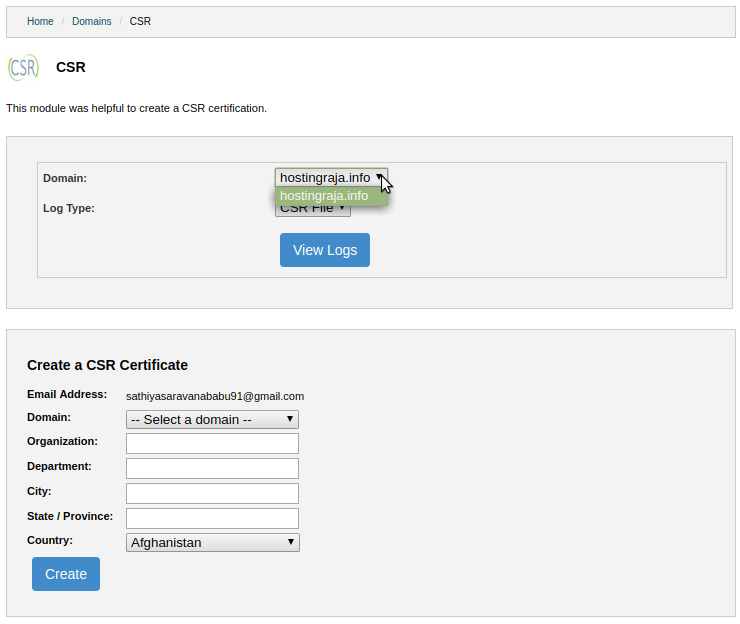 Now you can select the domain from the drop-down menu and select log type CSR File or Key File from the drop-down menu. Step10: Press view logs to view CSR file and Key file which is generated.